Classroom Organization- Managing the PAPERS!!! 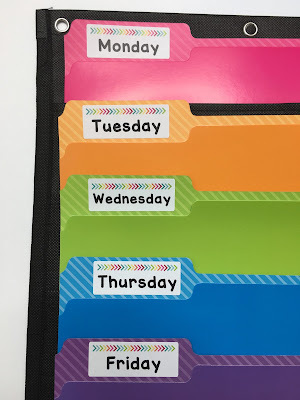 Today I'm going to share with you a tried and true system for classroom organization. This easy and CHEAP system can work for any teacher. No matter what grade level you teach, the one thing we have in common as teachers is PAPER! We are blessed with technology in our schools, but the paper hasn't gone away (and it NEVER will). Mounds of paperwork on your desk will drive you crazy, so I'm here to give you a quick hack for organizing all of those papers! Say goodbye to a messy desk and say hello to this beauty! I found this in the Back to School section at Target for $2.99. Here is what I do, after I prepare my lesson plans and make my copies, I slide all of the worksheets, homework, spelling lists, activities, read-aloud books, and anything special I will need into the file folder for each day of the week. 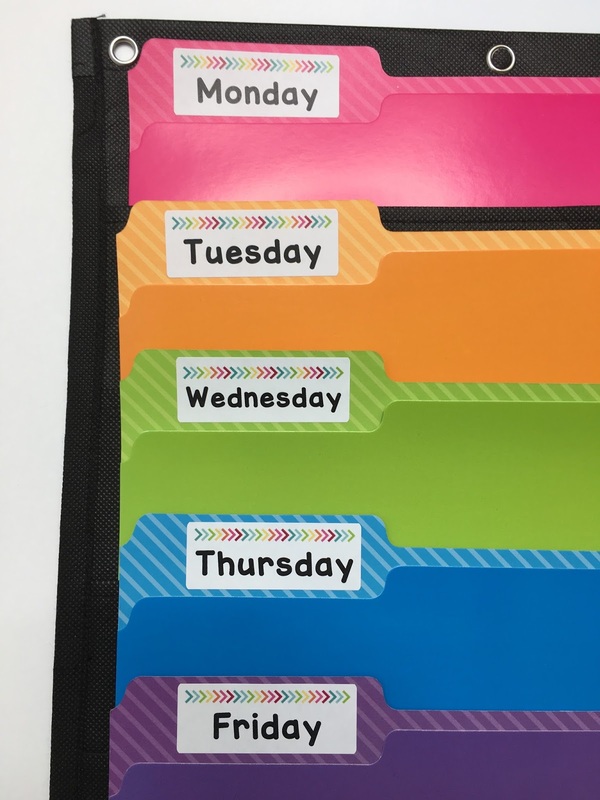 Instead of having papers on my desk, papers on my guided reading table, papers by my computer, etc., I know that all the paperwork I will need for each day is in the folder for that day. If we don't get to an activity, I take it and shift it to the next day, or save it for the following week. This system is also amazing because if you unexpectedly need a sub, everything they need will be right in the file folder! On Monday, I will need spelling lists, math worksheet for centers, adjective activity, and Chicka Chicka Boom Boom for read-aloud. I slide all of this into Monday's folder. It's so simple, but it is an amazing system. 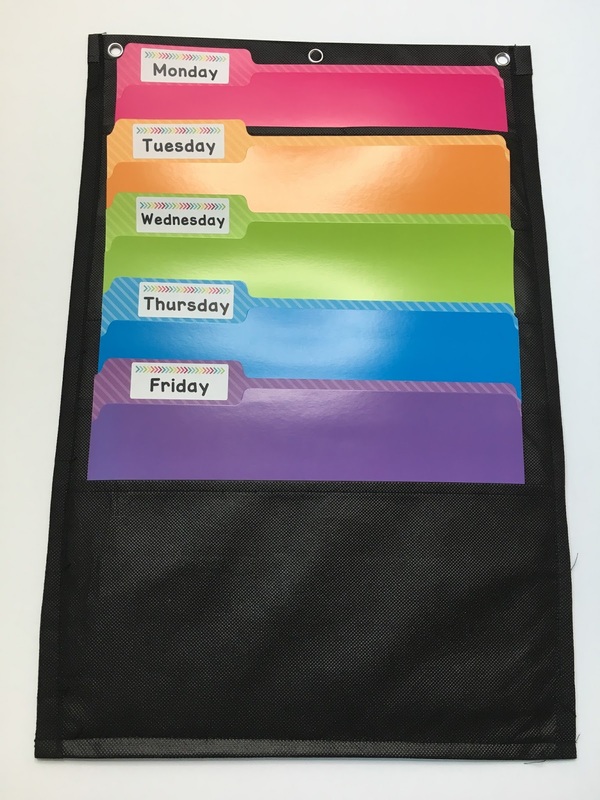 Over the years, I've tried so many ways to organize classroom papers-- mailboxes, trays, file folders on my desk, filing cabinet, file box-- and this is the best system by far! You can display it on a bulletin board, or just hang it on the wall behind your desk like I did. It's cute and colorful, and the best part is that it keeps the mess off your desk! This awesome Art Skills organizer came with labels, but I printed some out on Avery address labels instead of hand writing them. 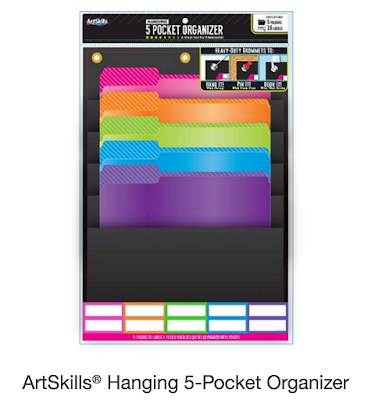 There are tons of hanging organizers out there, but you can't beat this cheap one at $2.99!